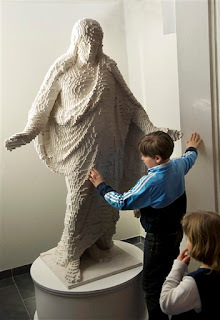 It took 1.5 years and almost 30,000 Lego bricks to construct a nearly six foot tall Jesus. The Oensta Gryta Church in Vaesteras created a replica of Danish sculptor Bertel Thorvaldsens’s 19th century statue “Christus”, which depicts the resurrection of Jesus. The Pastor, Per Wilder, said that the statue would remain in the church, that it would not be sold on EBay, and that it wouldn't be moved to the children's department where he feared it would be disassembled and the bricks used to make Star Wars toys.